Find out how to enter the PowerStop.com Sweepstakes at PowerStop.com for a chance to win a 2017 Ford Mustang. 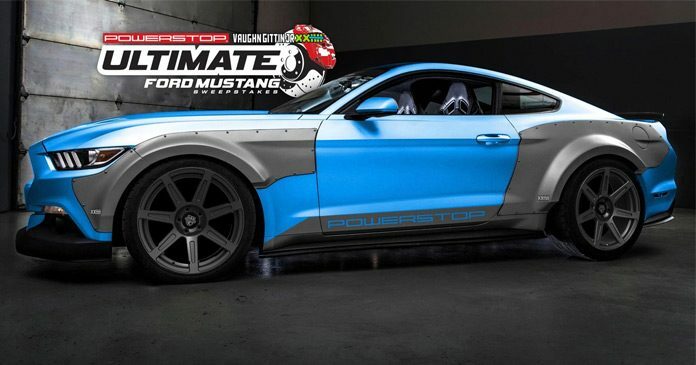 Power Stop and Vaughn Gittin Jr. are teaming up to bring you the Ultimate Ford Mustang Sweepstakes and offer you the chance to win the ultimate car for the road and the track. The winner of the PowerStop.com Sweepstakes will drive home a 2017 supercharged Ford Mustang with performance upgrades valued at $36,000. This one-of-a-kind drift machine is built by PowerNation’s Detroit Muscle and features Power Stop’s Track Day Brakes, RTR components and tons more go fast parts! Visit www.powernationtv.com, powerstop.powernationtv.com or www.powerstop.com during the Sweepstakes Period. Correctly follow the instructions to complete all required registration information (which may include your name, a valid and active email address, mailing address, and phone number). Agree to the official rules. Click “ENTER” in order to complete an entry into this Sweepstakes. Subscribe to PowerNation’s or Power Stop’s YouTube Account (maximum of 1 bonus entry). After entering the Sweepstakes, there will be a link to each of the above actions. Eligibility: The Power Stop and Vaughn Gittin Jr. Ultimate Ford Mustang Sweepstakes is open only to legal residents of the 50 United States and the District of Columbia (specifically excluding Guam, Puerto Rico, and all other U.S. and foreign territories and possessions), who are the age of majority in their state of residence at the time of entry, and currently reside inhe Eligibility Area at the time of entry. Promotion Period: Begins at12:00:01 PM CT on May 27, 2017and ends at 11:59:59 AM CT on November 27, 2017. Limit: Limit of one entry per eligible person, per week, during the Promotion Period. Random Drawing: The potential prize winner will be chosen by random drawing on or about December 4, 2017 and notified on or about December 11, 2017 from all eligible entries received. Winners List: For the name of the winner, please send a stamped, self addressed envelope to RTM Productions LLC., Attn: “The Power Stop and Vaughn Gittin Jr. Ultimate Ford Mustang Sweepstakes”, 130 Southeast Parkway Court, Franklin, TN 37064, by December 4, 2017. Sponsor: Vaughn Gittin Motorsports, LLC, located at 2313 Orsburn Lane, Joppa MD 21085. Administrators: RTM Productions, LLC, located at 130 Southeast Parkway Court,Franklin, TN 37064. For complete details, please read the official rules.